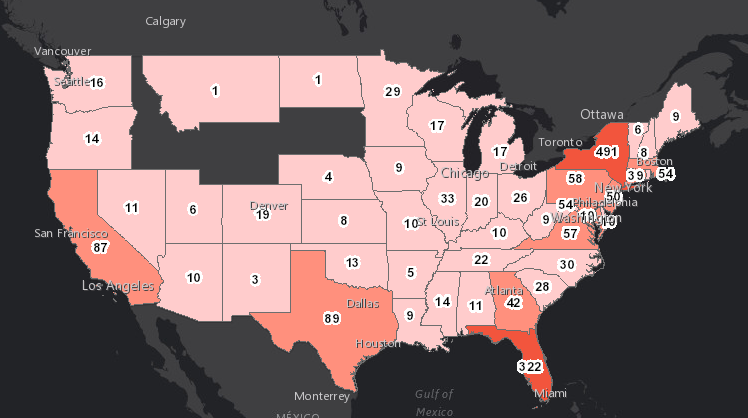 The U.S. Department of Health & Human Services (HHS) Office of the Assistant Secretary for Preparedness and Response (ASPR) today created a publicly available interactive map showing the number of Zika virus cases in each state. The map, which uses GIS software from Esri, will help monitor the spread of the Zika virus across the United States and 34 other countries where cases have been reported. The map will reportedly be automatically updated each week to reflect any new outbreaks. The Esri technology draws on U.S. Census data, and shows ASPR experts where to target prevention efforts, particularly among women of child-bearing age and their partners. By allowing ASPR to monitor the spread of the Zika virus, they can properly dole out domestic assistance and resources to the states with the greatest number of cases. Zika virus is spread to people primarily through bites from infected Aedes aegypti mosquitoes or through sexual contact. The health impact is greatest on growing fetuses, which can develop a serious birth defect called microcephaly. Multiple systems of record for reported infection cases. Limited access to infection information, particularly in the field. Difficulty in finding the information needed. Little to no ability to share information and collaborate across teams. Difficulty in analyzing infection information in a meaningful way. They conclude that using GIS technology for disease surveillance and control will help teams overcome the five challenges and more successfully treat and combat diseases like Zika virus.